In the upstream oil and gas industry, digital transformation is changing how we do business. In fact, according to Booz Allen Hamilton in December 2018, digital transformation of E&P proprietary data could save the industry as much as $1 billion each year while boosting production up to 8 percent. E&P data is commonly stored in warehouses on decades of various media technologies that cannot be accessed on today’s platforms, and that means missed opportunities. Geophysical companies are sitting on a wealth of information, and how you use your E&P data can make the difference between having to tolerate production plateaus when you could be using new technology to wrest fresh income-generating insights from your historical data. Yesterday’s thinking about the value of E&P data is why, according to Teradata, upstream companies can lose as much as 8 billion dollars per year in non-productive time as their geoscientists, petroleum engineers and data managers spend as much as 70 percent of their time pouring over mountains of well data (cores, logs, scans, samples) and seismic data (sound-wave maps of subsurface layers and reservoirs, both onshore and offshore). To make matters more complicated, this E&P data is contained in myriad current and legacy software applications, databases, data recording sensors, paper and tape records. Storing, managing and organizing massive volumes of hard-copy proprietary records and media archives, and then trying to locate and access the specific data needed for analysis, interpretation and processing, is a cumbersome, challenging and inefficient process. It’s so inefficient that the McKinsey Report (CNBC 20154; 2015) says the oil and gas industry currently generates value from only one percent of all the data it creates. How to quickly find, access and make sense of all the propriety E&P data and metadata held within their company’s information stores and department silos? How to consolidate, manage and access all that information in order to then analyze and aggregate it into meaningful decisions? How to extract actionable knowledge about, and mine fresh insights into, potential subsurface hazards and opportunities, given all the current and legacy records that exist? Now that we recognize the challenges, let’s focus on how digital transformation of E&P data can optimize operations and create new value from old seismic data. Simply by conducting your daily operations you have amassed and stored a virtual goldmine of subsurface data – several petabytes by Deloitte’s estimation – of bankable geophysical information. When you digitize and transform these priceless libraries of paper records, recordings, 2D and 3D and other analog information into secure cloud-based digital data records, you’re putting decades of valuable E&P information at the fingertips of your geoscientists and data managers to use whenever and wherever they need it. It’s stored securely and privately in the cloud, where it’s safe, protected and accessible. With powerful data analytics, your secure treasure trove of digitized geoscience data can be instantly read, indexed, interpreted, manipulated, verified and accessed with smart-tool technologies that incorporate artificial intelligence (AI) and machine-learning. You can mine your historical, current and future data to find new patterns contained within that accumulated wisdom to ask better questions and make faster and better decisions. Many people think the term Big Data simply means having to deal with vast amounts of data. That’s true, but it also means focusing on how to grow your business by effectively integrating all aspects of the data you’ve accumulated over the decades to solve new problems and challenges. Big Data means breaking the barriers between departmental data silos, and increasing visibility throughout your operations. It means creating your company’s own E&P Internet of Things (IoT) for your geoscientists and data managers to harvest at will, making new discoveries with old data, reducing the costs of new discoveries, improving well success rate and increasing profitability. In a recent GE/Accenture report, surveys show that 81% of senior executives believe that Big Data analytics is one of the top three corporate priorities for the oil and gas industry. In E&P operations, Big Data can be used to uncover non-productive time and activities, highlighting not-so-obvious operational losses and oppressive sunk costs. It can identify opportunities to boost production from existing assets and extract financial value from all available operations, no matter where the subsurface data originated or where it currently resides. Digital transformation of E&P data creates an open data culture with full governance and good analytical accessibility within in a protected environment. Instead of just connecting the dots, Big Data connects the datasets by mining your libraries of digitized seismic data to quickly access information and extract additional intelligence, pinpoint your most valuable assets, derive new patterns of strategic planning, and create new avenues of thinking about how to increase efficiency and escalate profits. Because of the vigorous process involved in digital transformation, your digital assets have become more secure and of higher quality, which promotes greater confidence in decision-making. But where does your vital E&P IoT data reside in the cloud? Where should it reside? Cloud computing brings the benefits of digital transformation and data analytics to your local network – as well as a network of remote Internet-hosted servers – to store, manage, process and manipulate through an online interface. Cloud computing allows you to analyze a wealth of data quickly at a reduced cost, and provides an on-demand off-premise environment for disaster recovery solutions. Beyond the cloud, you have expanded choices for visualizing and mining your seismic data depending on your company’s dataset sizes, needs and budget. A hybrid-cloud computing environment uses a mix of on-premises, private cloud and third-party services, with orchestration between the two. By allowing workloads to move between them as computing needs and costs change, hybrid cloud gives you greater flexibility and more subsurface data deployment options. A multi-cloud environment refers to the ability to leverage two or more cloud computing platforms but not necessarily requiring connectivity or orchestration between them. Choose the digitized-data storage method that fits your needs now, but keep your eye on the future. After all, you’re growing. Creating a cloud-based E&P Internet of Things – an open data culture in a protected environment with full governance and analytical accessibility. 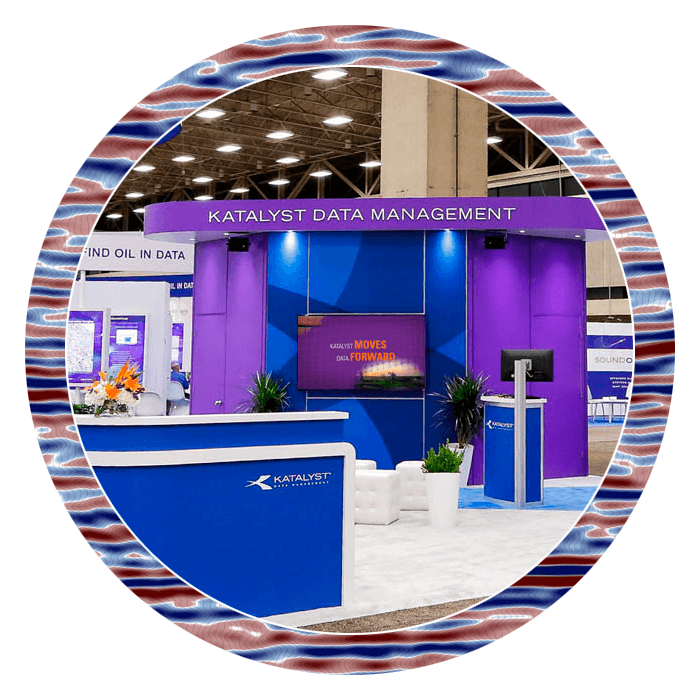 To get started, give Katalyst Data Management a call. We provide the only integrated, end-to-end data management and consulting services specifically designed to help companies like yours implement digital transformation of E&P data from every major basin worldwide.